California loves its locally sourced meat and dairy, but conservationists claim the foodie trend can cause serious damage to the state's grasslands. 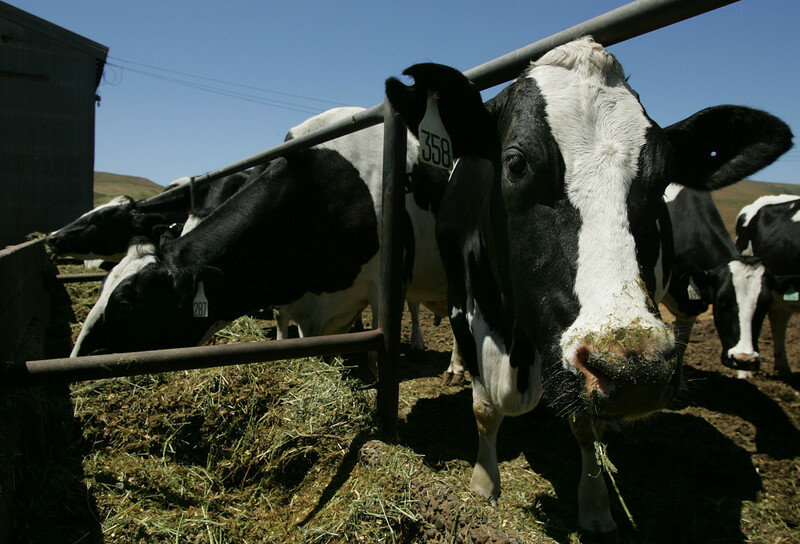 Cows eat a mixture of alfalfa, hay, and corn at a dairy farm in Point Reyes Station, California. Some national environmentalists are taking a stand against sustainable ranchers. This story was produced in collaboration with the Guardian. An hour north of San Francisco lie two-dozen dairy and meat farms that have produced some of the most beloved artisanal brands in northern California—along with a farm-fresh, locally sourced foodie ethos that has become globally influential. All the dairies in Point Reyes are organic, and the beef is grass-fed. They are models of sustainable farming, providing the raw ingredients for cheesemaker Cowgirl Creamery, the Straus Family Creamery, and Marin Sun Farms meats, to name a few. Yet some national environmentalists are taking a stand against these ranchers, who have farmed for generations on grasslands that are now part of Point Reyes National Seashore, claiming they are despoiling a landscape visited by 2.5 million people every year and should be ejected. Cows, the environmentalists argue, do not belong in a national park. "Visitors come to Point Reyes seeking a wild part of the coastline of California, in order to view wildlife, walk on sand beaches, and tour dramatic ocean cliffs unhindered by private property and development," says Erik Molvar, executive director of Western Watersheds Project. "They do not come here to see herds of cattle on overgrazed weed plots." His Idaho-based group is one of three that sued the National Park Service in 2016, claiming that Point Reyes cows were causing environmental damage, interfering with recreation, and harming the herds of tule elk that roam the landscape. Now, a local Democratic congressman, Jared Huffman, has teamed up with an unlikely Republican ally from Utah, Rob Bishop, to introduce legislation to protect the ranchers, whose leases are expiring. Huffman has proposed extending them for 20 years. While Huffman&apos;s environmental record is pristine, Bishop&apos;s decidedly is not; he led efforts to eliminate Utah&apos;s Bears Ears and Grand Staircase-Escalante National Monuments, opening them to the fossil fuel industry. "Multi-generational ranching in a small portion of the seashore is part of the culture and the landscape and the character that was always meant to be protected," Huffman says. Sue Conley, one of the founders of Cowgirl Creamery, agrees. "The ranches have contributed significantly to the sustainable food scene" in the area, she says. "It&apos;s a great model to have working farms in a national seashore, connecting consumers with farmers. There&apos;s a consciousness that comes from being around nature and farming that&apos;s really important to urban life." Lying along the San Andreas fault, Point Reyes National Seashore is a foggy 111-square-mile peninsula of wilderness, grasslands, rocky windswept beaches—and dairy and cattle ranches. Cows and hikers have co-existed uneasily at Point Reyes since 1962, when President John F. Kennedy designated it a national seashore. To create the park, the government bought the ranches, which had been there since the Gold Rush, leasing them back long-term to families who had been working them for generations. It was a lifeline for the small producers, who faced threats including commercial agricultural enterprises and urban sprawl. The argument over cattle in Point Reyes actually started with oysters, which had been farmed in an estuary in the national park since the 1930s. 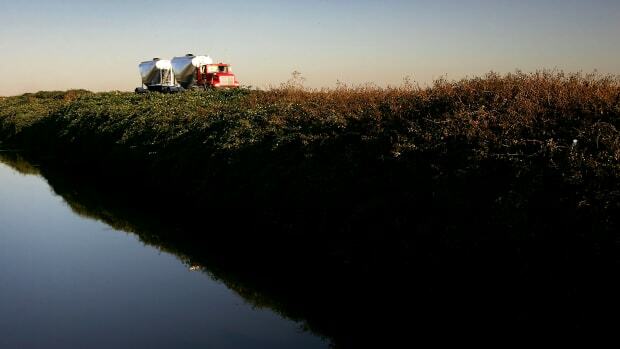 Like the ranchers, a local company also had a long-term lease—and, when it expired, chef Alice Waters, Senator Dianne Feinstein, and author Michael Pollan sided with the oyster farmers in their bid to stay put. Nevertheless, in 2014, the then-Secretary of the Interior Ken Salazar decided that the oyster lease, which was in an area designated as wilderness, would not be renewed. Environmentalists started to wonder: If oysters could be evicted, why not cows? 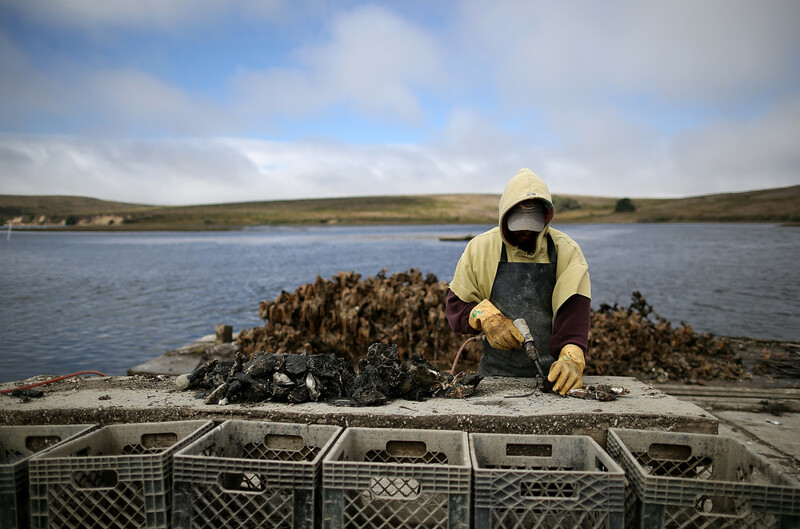 An oyster fisherman uses a power tool to break apart freshly harvested oysters near Point Reyes National Seashore, California. The argument over cattle in Point Reyes actually started with oysters. Last week Bob McClure surveyed a rare sunny sky and two tule elk bulls in the distance on his grazing land. "We&apos;ve been led to believe that we would always stay here," says McClure, a fourth-generation farmer whose family gave McClure Beach to the national seashore before World War II. His 1,400-acre dairy is perched above a hiking trail and hills that tumble to a seaside lagoon. "We&apos;ve worked cooperatively with environmentalists for 50 years," he says. "We get that this is public ground, and we&apos;re stewards of it." Both sides argue over the original intent of Congress in setting up this unusual park with historic ranches within its boundaries. "This wasn&apos;t supposed to be Yellowstone or Yosemite," says environmental writer John Hart, who has written histories of the area. The original plan was for the seashore to be developed as a sprawling beach recreation area, crisscrossed with roads, boardwalks, and beach businesses. Regional environmental and agricultural groups have mainly sided with the ranchers, whose organic, sustainable products are mainstays of the vibrant local food scene. They say that efforts to rid national parks of cattle may make sense elsewhere in the arid west, but Point Reyes has been grasslands for centuries owing to grazing by tule elk. 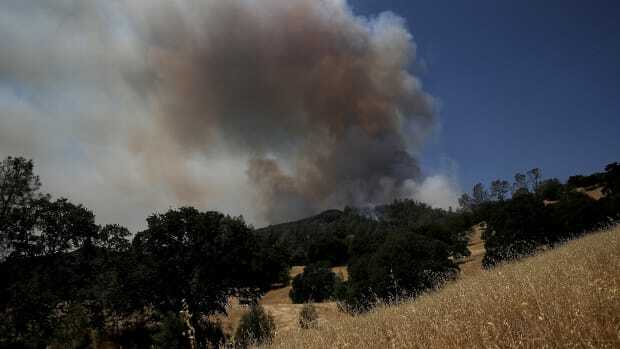 "The ranchers are making improvements that actually help protect and restore the lands," says Linda Novy, president of the Marin Conservation League, which supports Huffman&apos;s bill. "By grazing, the cattle maintain the rare coastal prairie ecosystem." Without the cattle, the grasslands that characterize the hills of Point Reyes would quickly turn into dense coyote brush. David Lewis, county director of the UC Cooperative Extension in Marin County, estimates that the Point Reyes ranches contribute as much as 20 percent of the county&apos;s $110 million in annual agricultural production. Given the industries that support agriculture—feed companies, veterinary services, a grass-fed beef butchery—the overall economic output of the ranches may be three times that amount. If the ranches closed, Lewis says, "You&apos;d be losing about $60 million a year in production." The ranchers also contribute more than 5,000 jobs in the region, on and off the farms. Albert Straus, founder and chief executive officer of Straus Family Creamery, an organic local dairy that supplies milk to Cowgirl Creamery and others, says the ranchers are the linchpin of the local agricultural economy. Without them, the viability of the small farms in the county is at risk, he says, because the county needs a critical mass of ranches to get essential services, such as feed deliveries. "Eliminating or reducing the farms in the park would have a huge impact on the few farms that are left" in the area, he says. "It would devastate our dwindling schools and community." For the national environmental groups, though, these commercial concerns are secondary to protecting wilderness. They raise eyebrows at the fact that Huffman reached across the aisle to a Republican like Bishop to introduce the bill. "It&apos;s shocking that Representative Huffman would team up with anti-public lands zealot Rob Bishop to undermine the public planning process already under way at Point Reyes, hand these public lands over to ranch and dairy operations that have already been paid to get off the park, and turn a blind eye to the ecological damage this land use is doing to this special place," says Chance Cutrano, director of strategy at Resource Renewal Institute. Whether or not the legislation passes, the National Park Service is continuing its own long-term planning process. While options for ridding the park of ranchers are on the table, its initial proposal to the public is to give the existing ranchers 20-year leases. As his cows munched on grass, McClure, the rancher, suggested a solution that sounded both old-world and downright practical. "We need to collaborate," he says. "We all need to sit down at the Point Reyes fire station and hammer these things out." This story is published in collaboration with the Guardian as part of its two-year series, This Land Is Your Land, with support from the Society of Environmental Journalists. 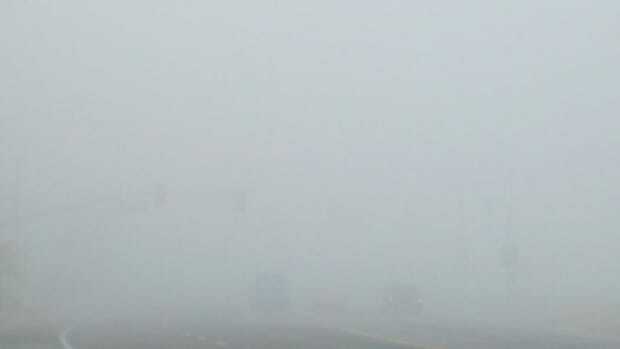 California's orchard-nursing fog is withering away, and scientists aren't sure why. 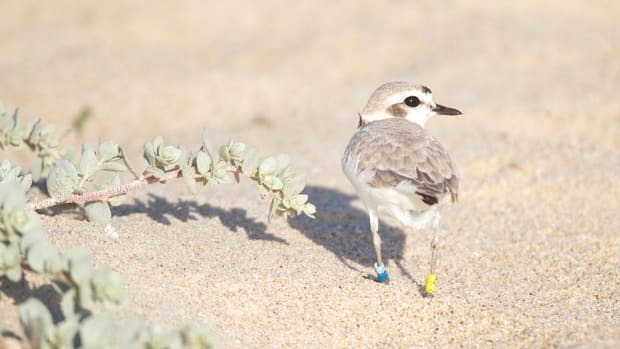 A controversial firing at the California Coastal Commission has conservationists closely watching the agency that controls development along the state's shores.